"Light houses and stations are of interest to the public, and permission to visit them is often appreciated and is of educational value." Lighthouse Service Bulletin No. 10, October 1912. "A morsel of genuine history is a thing so rare as to be always valuable"
Some recent events have been dragging me back into the world of Long Island lighthouses. I'm working on a new lighthouse-related project, and may even need some volunteers in the near future. Keep an eye on the site, which I will be freshening up bit by bit, for any news. I hope to see some of you again soon. Copies of both of my lighthouse books are available. 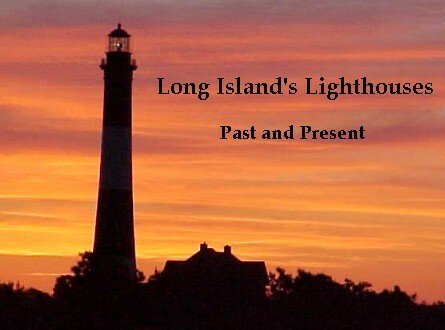 My 2004 book, Long Island's Lighthouses: Past and Present takes you on an unprecedented in-depth tour of the history of Long Island's lighthouses and lightships, including archival photos and lots of human interest stories. The quality of this book was a contributing factor in my being awarded the US Lighthouse Society's annual President's Award in 2005. 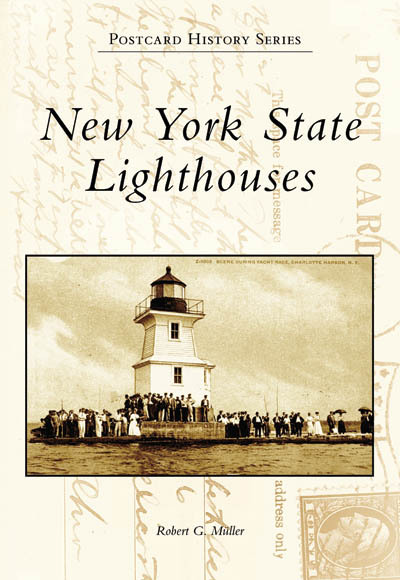 My 2006 book, New York State Lighthouses, includes 198 early-1900s postcard images and approximately 14,000 words of historical information, covering 70 sites. Two lightships and several non-federal lights are included. The book is an introduction into the lighthouse legacy of the state with the second highest number of lighthouses in the US (Only Michigan has more). Waterways covered include Lake Erie, Lake Ontario, St. Lawrence River, Lake Champlain, the Finger Lakes, Hudson River, New York Harbor, Long Island Sound, and Atlantic Ocean. The New York book is available all over the place, (List price: $20) including the St. James General Store, the Fire Island Lighthouse, Barnes & Noble, Borders, and Amazon.com. The Long Island book is getting tough to find, but you can sometimes find a deal on a used one at Amazon. Here's a map of New York State in 1796. About the Long Island's Lighthouses: Past and Present and New York State Lighthouses books! My father Louis Müller (1912-1992) who would have loved the nostalgia of my historic research projects and read every word of every page of the research materials and final outcomes. Dad spent most of his life on Long Island and loved the water. He even specified that his ashes be spread on a small island on the Great South Bay, where he spent many summer days with his family and friends. From Dad's final resting place, one has a nice view of the Fire Island lighthouse. Dad at Sexton Island. December 1980. The Fire Island lighthouse is on the left side of the horizon. California artist Donn Rhodes. Donn loved lighthouses, among many other things, and was going to be the illustrator for my first book. Although I never got to meet him in person I can say without hesitation that he was an impressive man and we are all a little poorer for his absence. I am happy to have known him for the short time I did, and I am a better person for it. Avvie (ca. 1982-2000), the little old ex-puppy mill mother Beagle who taught me more about being a decent human being than any philosopher or theologian ever has. Her gentleness, patience, humility, love, trust, devotion, strength in the face of adversity, appreciation of the simple things, and enthusiasm for life will always be an inspiration. If more of us were like her, the world would be a much better place. Ben and Jean Wagenhauser. Uncle Ben and Aunt Jean were an important part of my life (whether they realized it or not). Losing both of them in late June/early July 2003 has been tough on all who appreciated their honest humanity. Aunt Jean was a member of the e-mail list that was an early part of this site, and was eagerly awaiting my Long Island lighthouses book. I hope that some of what I learned from them is evident in the work contained here, in the book, and in my historic preservation efforts. Tom Taylor, Former President of the Florida Lighthouse Association - Tom was the historian at the Ponce Inlet, Florida lighthouse in 1999, when I first met him. From that point on, I considered him the high water mark for historic lighthouse researchers, writers, and preservationists. He was also one of the greatest human beings I have had the honor to know. When writing my own book, I kept Tom's book on Florida's Territorial Lighthouses (an autographed copy of which I treasure) as my model, hoping to approach the depth and quality of research, readability, and palpable passion for history that Tom put into his work. His honesty, decency, humility, creativity, courtesy, passion, energy, high standards, and the fearlessness with which he would happily tackle the seemingly impossible will always an inspiration for my historic preservation efforts. On May 19, 2004, all of us lost a good friend. Warren Allen. Uncle Warren, as many of us knew him, was the grandson of keeper William Follett. He spent much of his childhood at the Cedar Island Light in the 1920s and 30s. He returned there for the first time in 69 years, with many of us sharing the moment, in August 2003. It was a treat to hear his stories of growing up at the lighthouse, and the lessons he learned there. Seeing him look around and relive his childhood -- you could see the memories in his eyes -- made me truly understand what is important about historic preservation. I am thankful that I had the chance to learn from him, and, perhaps, make his final years a bit more enjoyable as he saw his family's old home get some hope for the future. Uncle Warren's stories appear on pages 257-261 of my Long Island book; his photo is on page 260. The many lighthouse keepers and their families that kept Long Island's waters safe and continue to "keep the light" for a part of American history. All the text, code and photographs on this site, unless otherwise noted, are Copyright © 1998 -2014 Robert G. Müller.